The Coloured House, Ahtopol - снимки, цени на стаи, карта, описание на услуги и удобства, телефони за връзка. During the last few years the Colored House has turned into one of the main attractions of Ahtopol. With its design and colors it entertains not only the tourists but also the local people. An outcome of the most colorful dreams of its two creators, the Colored House offer to its guests an unforgettable stay in a unique friendly atmosphere. In this home of colors everyone can stay in a room of one's own taste. Each room has an individual color and every detail in it including the en-suite bathroom is made in the same color. The room design and colors are chosen to create atmosphere of lightness and spaciousness. Besides that all guest rooms are facing the sea. The garden bar gives you a wonderful opportunity to relax and have a good time with friends. For those who prefer to rest actively, the Colored House is a perfect starting base for trekking around the Strandja mountain, visiting the Butamya and Silistar beaches and other activities. The single rooms a spacious with large windows looking towards the see. They feature air conditioner, refrigerator, TV and en-suite bathroom. All double rooms have a TV set, air conditioner, fridge and private bathroom facilities. These rooms are capacious and light with windows facing the sea. These rooms are provided with individual air conditioning, private bathroom facilities, refrigerator and TV. They can easily accommodate up to three adults with enough room for all of them. The windows of triple rooms are also looking towards the see. 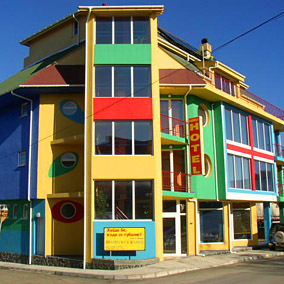 The Colored House is located at five minutes walk from the main beach of Ahtopol. Single Rooms - 34.00 - 44.00 lv. Double Room - 44.00 - 59.00 lv. Triple Roome - 54.00 - 69.00 lv.